Can I say something here? I LOVE camp. Not camping so much. I’m talking summer camp. More specifically, speaking to and loving on some pretty special students at camp. Yep. I’m definitely a fan! That’s where I am and what I am doing as you read this. A place near and dear to my heart. 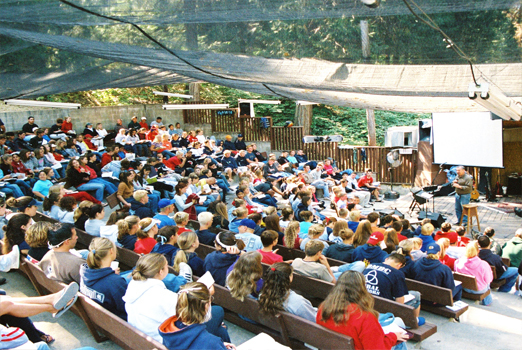 Hartland Christian Camp in CA. You can check it out by clicking HERE. I’m not quite sure what it is about camp that I love so much. Maybe it’s that everyone is (in theory, anyway) unplugged at camp. No Wi-Fi — which means no Facebook, no Twitter, no Spotify, no Tumblr, no Internet! — no TV, no cell service, no technology of any kind. It’s amazing how much easier it is to hear God’s “still, small voice” (1 Kings 19:12) when every other voice clamoring for our attention is turned off and tuned out. Perhaps it’s the setting. A place of spectacular beauty that leaves no credible doubt that there is a God. I mean, if we do not doubt the existence of Rembrandt as we behold his handiwork, how can any thinking person doubt the existence of God when we behold His handiwork? The blue skies, white puffy clouds, green trees, lush grass, the sounds of the wind rustling the leaves, the starry night glistening like peep holes into Heaven — what a portrait God has painted for us. At camp, we see different things than we see at home. And what we see, we see differently. Quite possibly it’s because for one blessed week, we are bathed in prayer by the many faithful friends and parents back home who get on their knees on behalf of the camp as a whole, the students individually, the staff, the members of the band, and the speaker. God’s hand is on the place. His blessing permeates, penetrates, and fills the camp like the air. You can feel it — no easy task for a guy like me who is anything but touchy/feely. Yet, feel it, I do. Or more accurately, feel Him, I do. Of course, it just might be because for six sacred days we become a family and — for all of us this week — Hartland becomes our home. A home where God’s Word is taught, God’s love is shown by every staff member to every student, God’s glory is on display, God’s the Father is pleased, God the Son smiles, God’s Spirit is at work, memories are made, friendships are formed, and lives are genuinely changed. Forever. Put it all together and guess what? I LOVE camp. Please, please, please become a part of our prayer team by praying for every single Junior High/Middle School student up at Hartland this week, for the staff, for the band, and yes, for the speaker — that God will be honored, His Word will be held up high, His name will be praised, and every one of us will leave the holy hilltop of Hartland changed. Forever. Dewey, couldn’t you try to be just a bit enthusiastic? What a great recap of the camp experience – brings back warm memories from MANY years ago. Yes, there is something about Christian summer camp! I’ll be in prayer for your group.